Set near the peaceful rural village of Lupton only a short drive from the popular market town of Kirkby Lonsdale, sits this imaginatively converted 13th century Grade II listed mill. The quality and attention to detail have been at the forefront in the development of this property with luxury brands such as natural stone tiles by ‘Pure Stone’ of Kendal, ‘Duravit’ sanitary ware, flooring by ‘Havwoods’, state of the art lighting control, built in sound system, security and CCTV, temperature control and underfloor heating all operated by ‘Control4’ offering room by room activation. Lupton Mill dates back to 1300 when it is documented that this historic building and original water wheel served as fulling mill making cloth produced from the wool from the parish sheep. The mill was later used for grinding grain and was still in use up until 1955. After hundreds of years the mill stopped working in 1984 when it was then converted to a private house. The present owners purchased the property 3 years ago and have carried out extensive and sympathetic refurbishment to create a stunning hi-tec five bedroom family home. Original features have only been enhanced by complimentary modern additions with the old and new seamlessly merging together to create a beautiful synergy and warming atmosphere across the three floors of accommodation. The grounds surrounding the property are a further testament to the design vision of the present owners and magically frame the idyllic backdrop of the mill. The well-tended lawns are bounded by the mill pond and Lupton Beck that has successfully served the mill over the years. 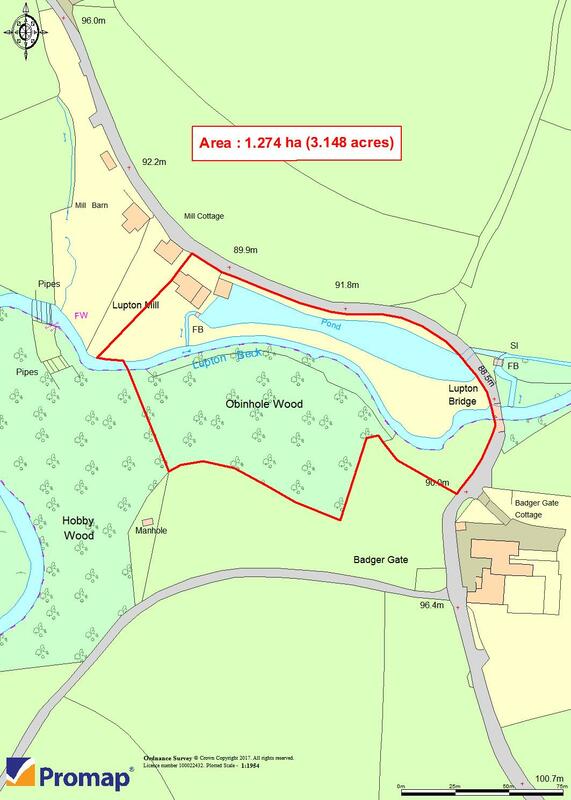 With an abundance of local wildlife, with a high degree of privacy and a separate woodland area across the river banks. The property benefits of sealed unit double glazed aluminium windows throughout. LED spotlighting features in every room. Lupton is a quaint village located just off the A65 that runs between junction 36 of the M6 leading to Kirby Lonsdale. The property is therefore well located for commuting to both the Lake District and the Yorkshire dales but also gains great access for the major business centres of the North West. The village of Lupton boasts a popular gastro pub only a short drive away, the vibrant town centre of Kirby Lonsdale with its full range of local amenities including shops, supermarkets, doctors, restaurants, cafes and much more. The town of Kendal is also just 10 minutes away and the city of Lancaster just 15 miles away, both of which host well connected train lines. Top of the range designed composite door with exposed brushed steel gudgeons, side windows, limed band sawn oak flooring with complimentary feature timber wall panelling. Wall mounted ‘iPad’ control panel. Limed band sawn oak flooring, built in enamel ‘Belfast’ sink with complimentary chromed mixer tap, window, oak block worktop, built in timber cupboards and storage. Access to underfloor heating system, alarm panel, plumbed for washing machine and dryer. Above the laundry room is a useful open storage area built into the eaves. Full shower with glazed screen with wall mounted monsoon shower and chromed hand fitment, low level w.c, wash hand basin on timbered vanity unit, chromed radiator towel rail, polished limestone flooring, extractor fan. Glazed balcony looking down to main sitting room. Original mill workings including supporting timbers and three large grindstones. Dual aspect windows with feature timber mantles to rear courtyard and front elevation. Original beams and room for a super king-size bed. Window with feature timber mantles, original beams, room for a super king-size bed, limed band sawn oak flooring. Window with feature timber mantles, timber panelled walls, original beams limed band sawn oak flooring, room for a super king-size bed. Four piece suite comprising low level w.c, shower cubicle with glazed screen, chromed wall mounted monsoon style fitment and hand shower. Twin bowl ceramic wash hand basins set of slate unit with complimentary chromed mixer taps with wrought iron stand and timber shelving. ‘Lakeland’ slate flooring and wall tiles, chromed radiator towel rail, extractor fan. Bespoke staircase leading to lower ground floor and first floor which is formed from a cast iron reinforced steel joist with a powder coated finish and limed oak treads on steel stations with complimentary steel handrails and glazed panels. Original mill workings including steel and timber tooth coggs connecting to the water wheel outside. Window to rose garden, front lawns and water sleuths. Double sliding composite French doors, full wall timber display. Built in shelving and racks with illuminated surround. Low level w.c, marble plinth wash hand basin with chromed mixer tap and fitment, chromed radiator towel rail, extractor fan. With comms cabinet and central control units. ‘Worcester’ floor mounted boiler supplying central heating and domestic hot water throughout the property with high pressurised hot water system giving a full supply to all bathrooms and showers. Open landing area with original timber beamed ceiling and automatically operated ‘Velux’ skylight. Superb open master bedroom, composite sliding doors leading to stone patio with stone surround walls and glazed panel. Separate double doors over orangery. Free standing timber wardrobes. Five piece suite comprising industrial style bespoke aluminium boat bath set on a studded plinth with a free standing chromed mixer tap and hand shower. Double porcelain sink set on a French marble top with bow fronted limed oak cabinet, low level w.c, fully lime stoned tiled shower cubicle with chromed antique style shower fitment, hand shower, marble tiled floors and walls, chromed radiator towel rail, original timber truss ceiling, original mill beam with pully wheels. Window to front and rear elevations with feature timber mantles, bespoke spiral staircase leading to child’s mezzanine play area with glazed panelling. Three piece suite comprising fully tiled shower cubicle with monsoon style shower fitment and hand shower. Composite wash hand basin set on bow fronted cabinet, low level w.c, slate flooring, chromed radiator towel rail, window with feature timber mantle, and extractor fan. Private gated entrance is completely unassuming with a paved driveway providing ample parking and leading to the entrance door. The property has beautifully maintained lawn and garden areas with lovely walkways, patios adjacent to the mill lodge and beck. Double detached garage constructed of stone, pitched slate roof supported on timber, feature decking and bathing platform. Mains electricity, mains water, sewerage to private septic tank, oil fired central heating providing underfloor heating throughout the property and domestic hot water. Control4 is the platform which brings together all the technology throughout Lupton Mill into a common single interface which is universally controllable from either the wall mounted iPads on every floor, Control4 hand controller or your phone. 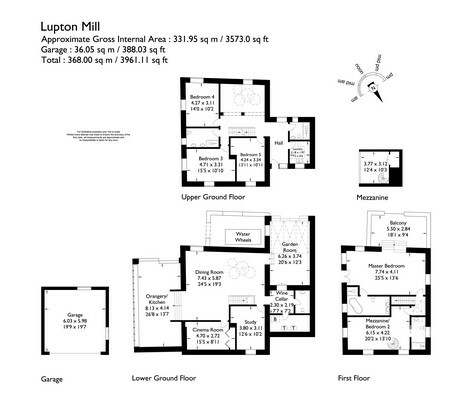 Control4 at Lupton Mill allows control over; lighting, heating, cinema room, sound, smoke alarms and cctv cameras.